A new building material called memory steel, developed at Empa is about to be launched on the market. The material can be used to reinforce new and existing concrete structures. When the material is heated (one-time), prestressing occurs automatically. Today, the steel reinforcements in concrete structures are mostly prestressed hydraulically. This requires ducts for guiding the tension cables, anchors for force transfer and oil-filled hydraulic jacks. The space requirements of all these apparatuses create the geometric framework conditions for every prestressed concrete structure; the strengthening of older structures therefore sometimes fails due to the high space requirements of this proven method. After 15 years of research work, experts from Empa now report an alternative method to series production readiness: shape memory alloys based on iron that contract during heating and thus permanently prestress the concrete structure. Hydraulic prestressing can thus be avoided—it is sufficient to heat the steel briefly, for example, by means of electric current or infrared radiators. The new building material will be marketed under the name memory steel. Several pilot projects, such as the reinforcement of various reinforced concrete slabs, have already been successful. The development of memory steel began in the early 2000s. In previous decades, Empa had already pioneered the strengthening of concrete with carbon fibre reinforced polymers (CFRP). This led to the idea of using shape memory alloys for prestressing concrete. Initial tests with nickel-titanium alloys were positive. However, the material known from medicine is far too expensive for use in the construction sector. In 2009, Empa researchers succeeded in developing an iron-based shape memory alloy, which they also patented. In 2012, researchers around Julien Michels finally founded the company Re-fer AG; Michels has been CEO of the young company ever since. Memory steel is intended to be used for the strengthening of existing buildings. For example, as soon as new windows, doors or lift shafts are installed in the concrete structure of an old building, a new reinforcement of the load-bearing structure is often unavoidable. In industrial buildings, the load-bearing capacity of an old suspended slab sometimes has to be increased. Thanks to memory steel, such tasks can now also be solved in confined spaces. A strip of special steel can be fastened under the ceiling using dowels and then heated with electricity or an infrared radiator. Alternatively, the reinforcement can also be set in concrete. First, a groove is milled into the surface of the concrete slab; then a ribbed reinforcement bar made of memory steel is inserted into the groove and filled with special mortar. Finally, the profile is heated with the aid of direct current and thus prestressed. Another variant is to embed the reinforcement bar in an additional shotcrete layer. In the future, memory steel could also be a proven method for manufacturing precast concrete parts with a previously unknown geometry. The hydraulic prestressing used to date creates friction in curved structures, which greatly limits the use of this method. With a memory steel profile embedded in concrete, highly curved constructions are now also possible. 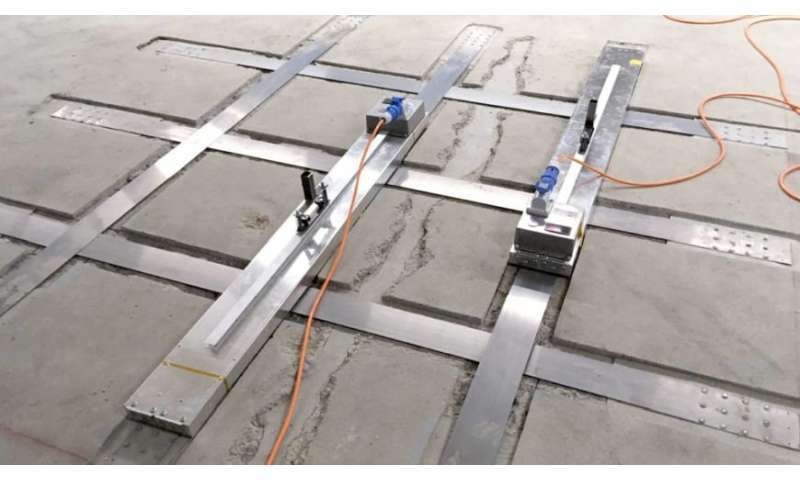 When heated, the profile contracts uniformly over its entire length without friction losses and transfers the stress to the concrete.